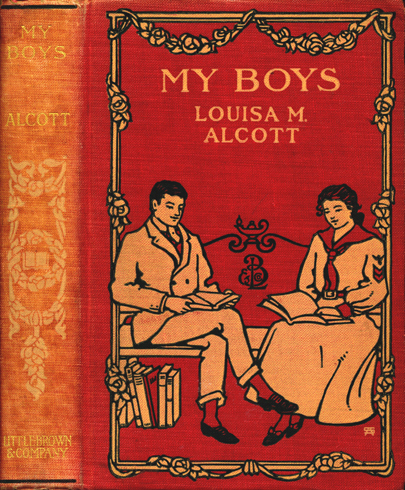 Part of a series of at least thirteen covers that Sacker did for Alcott works about this time. It is not certain when this design was first used. It appeared on My Boys (1903); it was later used for a book by Mary P. Wells Smith entitled Their Canoe Trip (1905, originally published 1889), Juliana Ewing's Jackanapes and Laura Richards' Toto's Merry Winter (ca. 1905). Note the Little, Brown logo between the two figures; it is only seen on this cover design by Sacker. 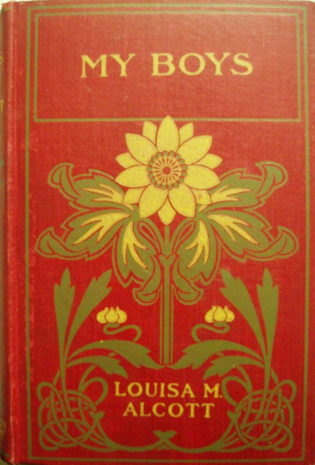 Curiously, another design, unsigned, retains the lettering of this cover [see below].